I usually get a little “dressed up” for Visible Monday, and fix my hair and lips. Today I’m slowing down to smell the roses, or hibiscus in this case. It’s all part of my goal to lead a slower and more simple life. I’m looking the way I do most any Florida summer day, cool and casual. This brown cotton skirt by CAbi (thrifted, sim) is one of my favorites. The fabric has a little crinkle to it and make a nice rustle-y sound. The DKNY sheer top is also thrifted (sim) and goes with just about everything in the closet. New Naturalizer sandals (sim) and over-sized white sunglasses (sim) finish the look. Outside one of our favorite cafes, the one with the pink hibiscus. Yes, take time for a scented break in the busy day. I’m wearing my own fuzzy hair today. I don’t remember hibiscus having a scent. At least in CA they don’t. This week we not only had heat, we had humidity. Severo returned from a gig in Fort Wayne, IN and said it was nicer there! I don’t miss Midwest/East Coast summer humidity at all! I’m too late to link this week, will do next time! Easy, casual look. I LOVE it! Well you know how I feel about makeup in the summer. A total waste of time when it’ll just melt off in a few minutes. I love a fresh and simple look. 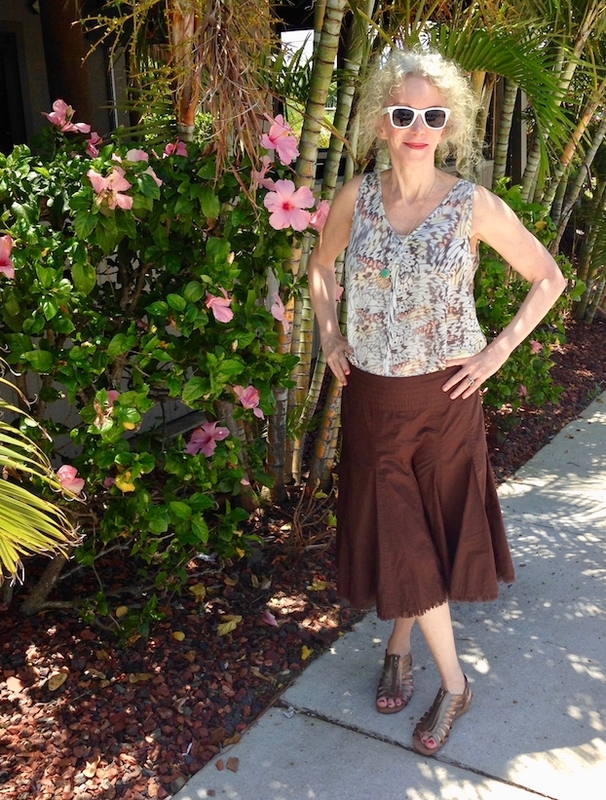 Beautiful simple summer day look…love it Patti! Beautiful look! Great post and blog! Lovely summer outfit, the top is really pretty. Thanks for hosting, hope you have a great week! You look relaxed, beautiful and fabulous and I love your natural hair so much. I really love your skirt and sandals. You look so pretty. Thank you for organizing your link up, I joined. I love clothes that make noise when they are worn. Very peaceful. Thank you for the link up. I love seeing what you pull together. I admire your style so much! You are right, Patti. We do need to slow down and smell the roses, hibiscus or any flower for that matter. Very nice casual look. Nothing like a pretty tank, skirt, and sandals to keep cool and still look great! Have a wonderful week. Pingback: I Found Some Shorts! - When the Girls Rule - A Fashion Blog for Women over 40 With Big-Busts, Apple-Shapes and Style! What a gorgeous garden! Those neutrals stand out in that beautiful nature surrounding you! Great summer look, Patti! It’s so important to slow down and really enjoy our surroundings. Love the rich color of your skirt, Patti! Such a pretty look! I love your casual summer look. I have found some of the best CAbi items at my consignment and thrift shop. It is a great brand. I love the color of your skirt too! I’m wearing a thrifted dress today too.! Peace! I love this easy feminine look! You look fabulous as usual, Patti! Yes, let’s all slow down and enjoy! You look great. Thanks for the link-up. I love that you are keeping it casual and simple today! Well done for taking time to smell the hibiscus and enjoy a slower and simpler life. The brown tones look so good on you Patti . You look great in your fuzzy hair and cool casual outfit! We don’t see enough of brown – like! Dearest Patti beautiful by the flowers. Cool and Chic…I love this skirt on you! Dear Patti, and it is a marvelous look on you – not only casual and relaxed, but also feminine and beautiful! And you are right, we all would benefit from smelling roses (or hibiscus)! Great relaxed outfit. Smelling the hibiscus. Good idea. And I love your relaxed linkup “rules” – so welcome. I preemptively fail at some linkups because I can’t follow all the guidelines. Sigh. Casual or dressy, you always have fab style, Patti! Love the little fringes on the skirt! Thanks for the link up, Patti…have a great week! Lookin’ good Patti, whether dressy or casual always chic and I love the sandals with zippers. I’m casual today in a simple T-shirt. Have a lovely week! Thanks for hosting! I am just happy to see brown, I like brown all year round!